Hope for Alison: ROAD TRIP! (This is Chris, btw.) You may have been wondering why Alison hasn't blogged in over eight months. Well if you'll remember back to October, Alison had a pretty rough couple of weeks with back-to-back hospital stays - which included her worst infection to-date and her first-ever seizure. Ever since, she's struggled to rebound to her normal (post-stroke) self, and her ability to blog and communicate has been hindered. I'll spare you all the details, but it's been a real challenge of all of us at times. We've consulted with local specialists the best we could, but are now taking a bigger step toward trying to figure out what happened back in October to cause all of this - in hopes we can figure out a better way to move forward. On Monday we're loading up the van and heading north to Rochester, MN. The neurology team at Mayo Clinic has agreed to see Alison. We'll be there for about two weeks. We're pretty excited about this opportunity. Mayo has such a great reputation, and Alison deserves the best possible shot at finding some relief. There's certainly no down side to having the best and brightest doctors in the country poking around in her brain for a couple of weeks. Who knows, maybe they'll stumble upon something that will help with more than just these recent issues! My prayers are with both of you. Hadn't heard anything in quite some time. I am proud of the man that You've become and cannot imagine the stress. I know that your love for each other has been a constant support. Pam cared for me for nearly a year when I had some health issues and I know that your love for each other and the blessings of our Lord and savior will continue to carry you. God Bless You BOTH. Hey Chris and Alison! Robert and I were just talking about not seeing any posts from Alison for so long...thanks for the update. We will be praying for answers...MAYO is the best, and yes, she does deserve the best! We love you guys! GOD bless you both. I've put you on the prayer tree at my shop. A lot of my customers will be in prayer for you too. Chris and Alison, as a caregiver for my 36 year old husband post stroke 3 years my heart and soul goes out to you. I stumbled upon your blog. I'm so glad I did. 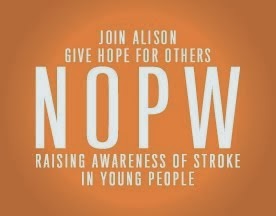 More of us young couples going through stroke recovery need to be connected. Our blog is Rachel& Jeremy cohen. Also a Fb group- jeremy cohen updates. We have been through seizures, depression, mobility clinical trials. ..still going. i can only imagine your journey. Please continue to share. You Chris and Alison are an inspiration. Sending healing energy your way.